Appearing around the cuticles of your toes and fingers, periungual warts are stubborn and difficult to treat. These warts start as small bumps and may develop into ugly clusters. The warts are painless when they are small, but larger clusters may be painful and may disfigure your nails and cuticles. It is important that you identify and treat them as early as possible so that you will be likelier to rid your skin of the warts around your nails so that your hands and feet will be beautiful and smooth once again. Periungual warts: What are they? How do I treat periungual warts? Can you prevent periungual warts? Periungual warts are rough bumps that appear around and under your fingernails or toenails. These warts have a rough, uneven appearance and texture with uneven borders. They are small at first, but they may grow into clusters without treatment. When they do, they may look similar to cauliflower, these warts may cause your nails or cuticles to split and may result in disfiguration if they are not treated. When they are small, they usually don’t hurt, but they can be painful when they grow larger. 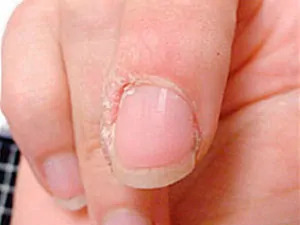 If they grow under your nails, they may cause your nails to detach from your skin as the warts separate them and lift them up while they are growing. Severe cases may leave permanently deformed nails, and if they grow into your nail beds, you may suffer complications from fungal infections. 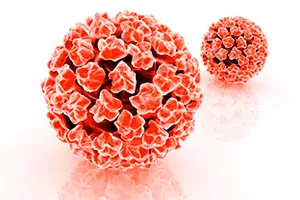 Periungual warts are caused by coming into contact with the HPV virus, which enters into the skin through small cuts or tears. This makes children and adults who bite their nails especially susceptible to contracting periungual warts because when they tear their cuticles, the highly contagious virus may then have entry points to cause the infection. People may also be likelier to contract them when their skin is softened by prolonged submersion in water such as by washing dishes in restaurants or swimming in public pools. You can learn more about what causes warts on fingers by reading this article. Children and young adults who pick, bite or tear at their cuticles and nails. People who have compromised immune systems. People who suffer from atopic dermatitis. People whose skin is submerged in water for long periods such as dishwashers or swimmers. People who share towels, personal items or toys with people who have periungual warts. When someone who has periungual warts touches a surface, he or she may shed some of the viri that causes the warts. The virus may stay behind on the surface and spread to others who touch it. If they have cuts or abrasions, they may then contract the virus and develop periungual warts. Keeping surfaces disinfected and frequently washing your hands can help to prevent spreading warts. While periungual warts are ugly and annoying, they can, fortunately, be treated. It is important for you to treat them as soon as you notice a wart because they grow rapidly and can cause permanent damage to your nails if they are left to grow unchecked. If the warts are around the outside of your nails on your skin, you can treat them with topical creams containing salicylic acid as well as other topical treatments. They may also be frozen off by your doctor or by using over the counter treatments. Periungual warts get their name from growing near the nails. If your periungual wart is growing under one of your fingernails, it is important that you see your doctor. He or she will advise you on the best treatment approach for periungual warts that are growing underneath your fingernails. In many cases, laser treatment may be a good and effective treatment for warts that are located underneath your nails. If the wart has already penetrated into your nail bed, your doctor may also prescribe medication to treat any resulting fungal infection in addition to treating the warts. Periungual warts are very contagious and easy to contract by coming into contact with people who have them or by touching infected surfaces. Avoid coming into contact with people who have periungual warts. Make sure that you disinfect surfaces in your home on a regular basis, especially if a family member has warts that are present. Never share towels, toys or other personal items with people who have warts. Do not share manicure tools or nail clippers with other people. Always observe good hygiene practices in public restrooms and locker rooms that are warm and moist as viruses grow in these humid environments. Don’t bite your nails or pick at your cuticles. As with other types of warts, the best way to prevent periungual warts is to always follow good hygiene practices, including hand washing, regular bathing and not touching other people’s hands who have obvious warts. It is also smart to wear flip flops or shower shoes when you visit public pools and locker rooms. Periungual warts may be spread to other parts of your body if you have them and fail to wash your hands. You can also spread them to others by touching them, so it is important for you to keep them covered while you are treating them and to wash your hands. Periungual warts that are around the outside of your nails may respond to at-home treatments, including over-the-counter salicylic acid treatments, other topical treatments, cryotherapy and some home remedies. If your wart is located under the nail, these treatments will not work because they will not be able to reach the wart and might cause additional damage to your nails. For those, you will need to see your doctor in order to have them removed. To learn more about treating a wart under fingernail, read this article. For warts that are not located under your nails and that are not in advanced stages, you can try home remedies such as apple cider vinegar, duct tape, over-the-counter topical creams, nail polish, and others. Warts that are at a more advanced stage or that are located under your nails may require medical treatment by your doctor, including the application of liquid nitrogen or laser therapy. In extreme cases, you may need surgery to remove your warts. It is best not to wait for the warts to simply go away on their own because they may stay for as long as two years and cause permanent damage to your nails. The best approach to ridding yourself of periungual warts is to treat them as soon as they first appear before they have a chance to grow and spread. Periungual warts respond to a variety of different at-home treatments. 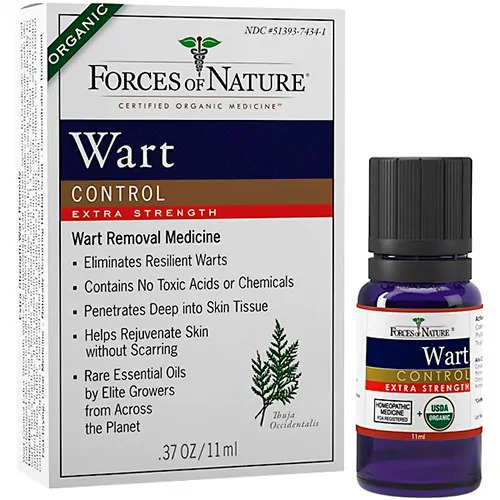 What it is: Wart Control Extra Strength is made by Forces of Nature. It is an all-natural wart removal product that you can use at home. It uses a combination of natural oils that have antiviral properties to help to boost your skin’s own immunity to the wart. Where you can purchase it: You can purchase it online at www.forcesofnaturemedicine.com. How you use it: After washing and drying the affected area, apply the oil and cover it with a bandage. Do this two to three times per day until the wart is gone. Most warts will flake off within about a week. 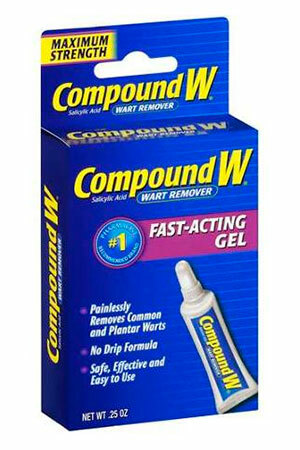 What it is: Compound W Fast Acting Gel is a topical wart removal treatment that uses salicylic acid to slough off the wart at home. Where you can purchase it: You can purchase Compound W at your local retail outlet or pharmacy. How you use it: Thoroughly wash and dry the area. Then, paint on the Compound W and cover it with a bandage. Repeat twice daily until the wart is gone. What it is: This is an at-home topical treatment that works by using ether and propane in an aerosol form to freeze your wart off. In some cases, only one application is needed to kill the wart, depending on its size. Where you can purchase it: You can purchase it online at Target.com or at your local retail or pharmacy store. 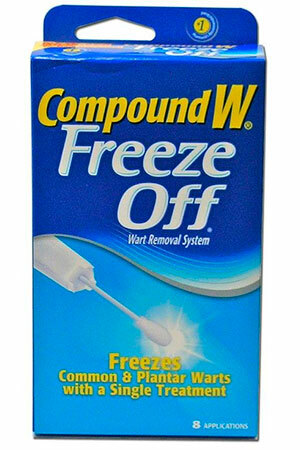 How you use it: After washing and drying the wart, apply the Freeze Off to it. The wart should fall off within a few days. If it does not, apply more of the Freeze Off on it. While periungual warts are unsightly, they are treatable. It is important for you to treat them as soon as you see them so that they do not grow and damage your nails and skin. If the wart is located under your nail, see your doctor immediately to determine the best treatment approach. When you treat them early, you can prevent damage to your nails and restore the beautiful skin on your hands and feet. You can find further details of Warts on fingers here. Please I had this warts on my finger nails when I had my first child and it has lasted for about eleven years now please help me ma I really want to get rid of it because it’s embarrassing me.